Our Winter Motown Tower is stacked high with chart-topping winter snacks including 29 oz. 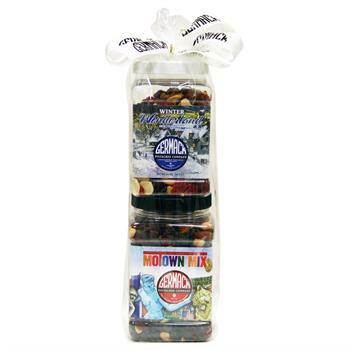 jar of Motown Mix - roasted almonds, roasted peanuts, dark chocolate morsels, raisins and cranberries; along with a 16 oz jar of Winter Wonderland Mix - dried cranberries and dried cherries with crunchy roasted almonds, cinnamon-spiced pecans, macadamias, and roasted cashews. This dramatic tower of snacks has sweet and savory mastered, and will make you yearn for Motown music and a Detroit winter!